It proved to be a great solution allowing to create a German version very fast. The package is open source, allows switching the locales at run time and also allows localizing any Dependency or Attached properties – not only strings. It provides “Translate” markup extension that can be used from within XAML. Each Value tag has an Id attribute used for matching values from the catalogs into XAML or C# code. The rest of the attributes specify WPF object properties and values that those properties should get under the locale. Translate markup extension refers to attribute title under Value tag with Id=0. 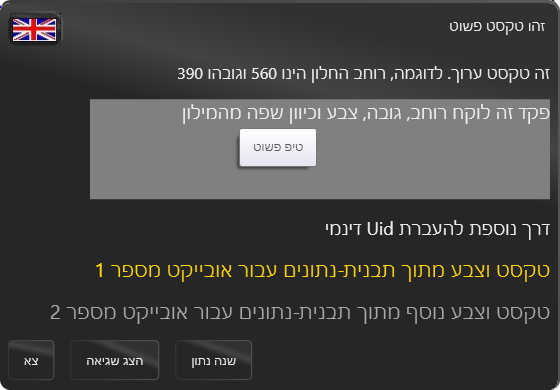 You can switch between English and Hebrew by pressing the button with the corresponding flag. As you can see not only strings, but also sizes and (even more impressively) the FlowDirection changes when the locale is switched. Please find more info at the WPF Localization – On-the-fly Language Selection and by browsing the demo code.